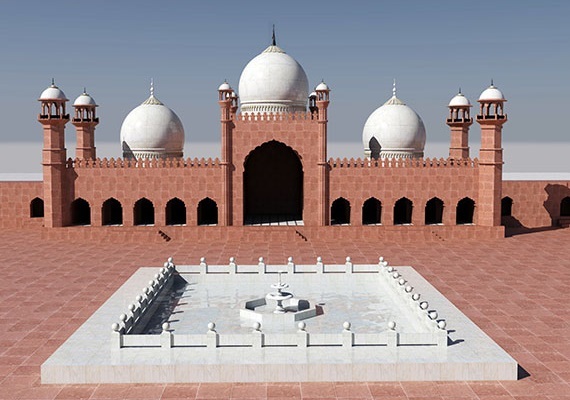 The Badshahi Masjid is a Mughal era mosque in Lahore, capital of the Pakistani province of Punjab. 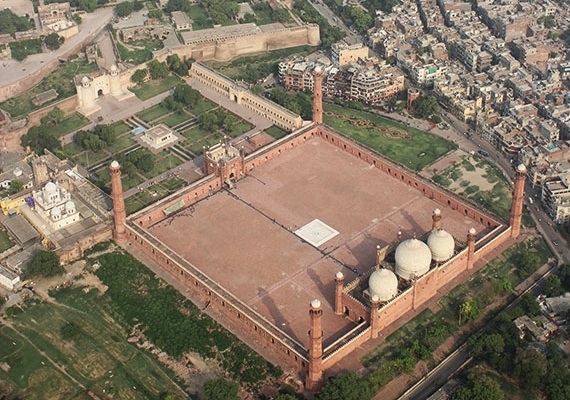 The mosque is located west of Lahore Fort along the outskirts of the Walled City of Lahore. The mosque is widely considered to be one of Lahore's most iconic landmarks. Badshahi Mosque was commissioned by Emperor Aurangzeb in 1671, with construction of the mosque lasting for two years until 1673. The mosque is an important example of Mughal architecture, with an exterior that is decorated with carved red sandstone with marble inlay. Upon completion, it became world's largest mosque and remained so for 313 years until the expansion of Prophet's Mosque. It remains the largest and most recent of the grand imperial mosques of the Mughal-era, and is the second-largest mosque in Pakistan. After the fall of the Mughal Empire, the mosque was used as a garrison by the Sikh Empire and the British Empire, but is now one of Pakistan's most iconic sights.